Is the US love affair with housework over? Sales of domestic cleaning products in the US have been falling for four years. So are Americans becoming less keen on sparkling homes? The country that gave the world the vacuum cleaner may be falling out of love with housework. 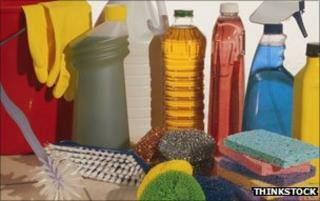 Sales of household cleaning products in the US have been falling since 2006, according to data company Mintel. Sales are down nearly 20% over that period, allowing for inflation. And Mintel forecasts a further 10% decline in the market during 2010-15, from $5bn (£3.16bn) to $4.5bn (£2.84bn). Other figures tend to back this trend. A spokeswoman for Reckitt Benckiser, which owns brands like Dettol, says that while its latest global results are strong, this is due to emerging markets not the US, where there has been a "market growth decline". So why are all-purpose disinfectants, window sprays and fabric cleaners falling out of favour? The Mintel report points to the squeeze on household budgets but also says there has been a "continuing shift in cleaning behaviour from the thorough top-to-bottom cleaning of a previous generation to an ad hoc approach where household cleaning happens on more of an as-needed basis". No doubt a lack of time and money play a part, but has there also been a shift in American attitudes? The US culture of cleanliness started during the American Civil War, says Katherine Ashenburg, author of The Dirt on Clean. A new sanitary commission dramatically reduced the number of deaths from dirt, which at the time was more likely to kill soldiers than bullets. But it was the birth of advertising - and the American willingness to be persuaded by it - that sparked a national obsession with cleanliness at start of the 20th Century, she says. Now the pendulum appears to be swinging away from "insanely overcleaning", she says, "partly because of environmental concerns and because people are getting smarter about advertising - and partly because it went too far". We live in cleaner environments now, she points out, helped by labour-saving machines like vacuum cleaners, washing machines and dishwashers. Yet we wash ourselves and our homes more than 19th Century farmers. There's also growing recognition that germs can be beneficial for your skin, she says, and good in the home. According to the "hygiene hypothesis," which was first documented in the British Medical Journal in 1989, exposure to bacteria, viruses and parasitic worms early in life helps prime a child's immune system. In support of the hypothesis, experts point to the recent boom in allergies in developed countries. When people ask me what was the worst you ever saw, it's always examples from the US I think of. Houses there are generally bigger and people consume more take-away food so there were more empty pizza boxes. And some have the habit of buying plastic cutlery and paper plates, to save washing up, but they don't end up in the bin. And there are many more cockroaches. But the US leads the way in advanced cleaning products, by a mile. This is one of the reasons why parents seem to be more relaxed about their cleaning regimes, says Carrie Longton of British parenting forum Mumsnet. "When you have your first baby, you're obsessed with cleaning and everywhere is 'Dettoled' and wiped, but once they start to crawl and everything starts to go into their mouth anyway, you relax, because you might clean the floor but they still pick up the toys that the dog has chewed." Instead of assiduously cleaning the home, she says, some people prefer to carry hand gel and give children a quick squirt on their hands. Despite the statistics on cleaning product sales, Anne Kocsis, author of The Complete Guide to Eco-friendly Housecleaning: Everything You Need To Know Explained Simply, argues that Americans are not cleaning less. They are being more savvy about how they do it. "More people are aware of the chemicals and more cautious about the things that they use in their homes, and the effect it has on them and the environment," she says. Vinegar and water can clean glass, while a mixture of baking soda with water acts as an effective surface cleaner, she says. And ditching paper towels for a re-usable cloth saves money and cuts down on waste. Interestingly, unlike Americans, the British are not turning their backs on cleaning fluids and sprays. Mintel says its figures for the UK market show that sales are still growing, despite the recession, a trend it explains by saying more people are entertaining at home and therefore are doing more housework. Europeans often view the American attitude to cleanliness as obsessive, a stereotype reinforced by the immaculate homes satirised in The Stepford Wives and Desperate Housewives. "A gym is a warm, moist environment with a lot of people jammed into a very small place. It's like a summer camp for bugs. They love it. "It might be a couple of days later, you get a head cold and you think 'Where did I get it?' You got it for being an idiot at the gym." But millions of Americans have recently been transfixed by the other extreme, as presented in the documentary series Hoarders, about people with compulsive disorders and cluttered homes. Despite the stereotypes, Americans only spend a small amount more per head than the British on keeping their homes spick and span, and the gap is narrowing by the year. If there is a new laissez-faire attitude to cleaning inside the home in the US, it's not an approach that should be followed outside the house, experts warn. The swine flu outbreak of 2009-10, which infected millions worldwide, reinforced the message of keeping hands clean. And a study led by Steve Zinder of North Carolina University advised gymgoers to take basic precautions to avoid picking up germs and catching a cold. So if dirt really is fashionable, it's wise to identify good muck from bad.